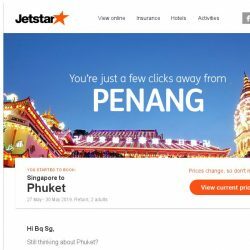 [Jetstar] Phuket is only a few clicks away, Bq Sg! 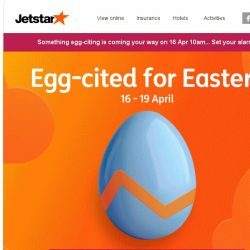 [Jetstar]  A last crack at our Easter FREE^ Fare Frenzy ending tonight! Hop in now. 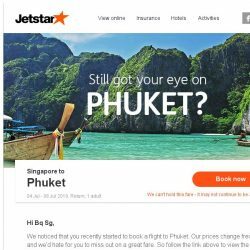 [Jetstar] Still want to go to Phuket? 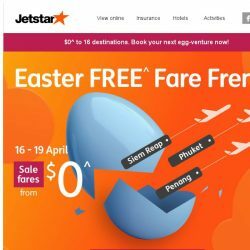 [Jetstar] You’ve been missing out on $0^ flights! $0^ to Bangkok, Phuket and more, book now. 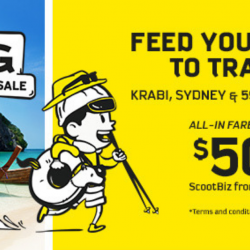 Book by 12 Apr 2019 Scoot: 5-Day Sale with Up to 25% OFF Fares to Perth, China, Krabi & More from SGD52! Studies say the more you travel, the younger you feel – fo’ real! 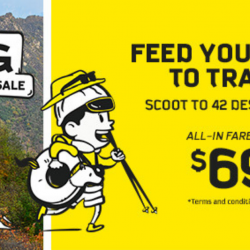 Guess it's time to shake things up and feed your need to travel with Scoot today! Scoot to 70 destinations including Perth, China, and Krabi from as low as $52! Sale ends 12 April 2019, 2359hrs. 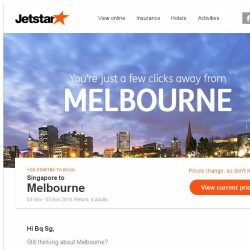 [Jetstar] Melbourne is only a few clicks away, Bq Sg! 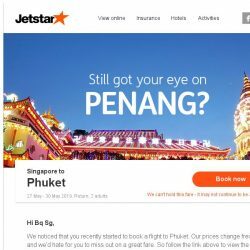 [Jetstar] Last call! Grab $0^ fares to Hong Kong, Melbourne and more now, sale ends tonight. 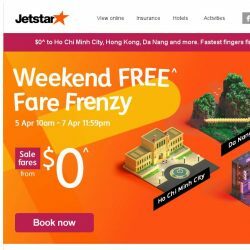 Book by 7 Apr 2019 Jetstar: Weekend FREE Fare Frenzy Sale with $0 Base Fares to Hong Kong, Melbourne, Manila, Ho Chi Minh City & More! Friday Flyday! Fly at just S$0 + airport tax to these fun destinations such as Hong Kong, Melbourne, Manila, Ho Chi Minh City and more on Jetstar! Airport taxes and fees range from S$49.80 to S$69.94. Sale ends Sunday 7 April 11.59pm SGT. 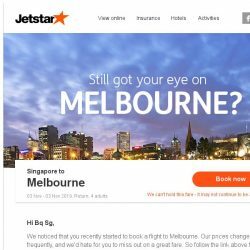 [Jetstar] Still want to go to Melbourne? 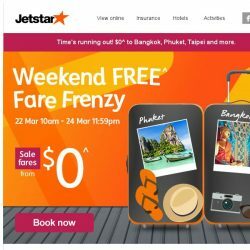 [Jetstar] 3 days only! $0^ to Hong Kong, Ho Chi Minh City and more. 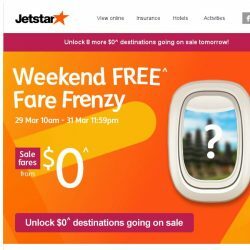 [Jetstar]  Unlock $0^ fares to 7 other destinations this week! Book by 2 Apr 2019, 2pm Scoot: Got-to-Go Fares from $69 to Over 40 Destinations Including Osaka, Tianjin, Hanoi & More! Feeling trapped? 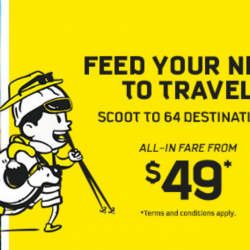  Got-to-Go vibes are here with Scoot's Got-to-Go fares from $69 to over 40 destinations! Including Osaka, Tianjin, Hanoi, Shenyang, Vientiane & more! Book from 7am to 2pm on 2 April 2019. [Jetstar] ⏳ Final hours! Don’t miss $0^ fares to Bali, Jakarta and more. 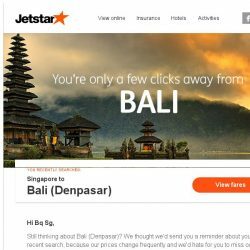 [Jetstar] Bali (Denpasar) is only a few clicks away, Bq Sg! 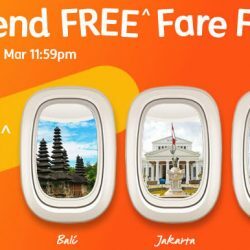 Book by 31 Mar 2019 Jetstar: Weekend FREE Fare Frenzy with S$0 Base Fares to Bali, Jakarta, Siem Reap, Sanya & More! 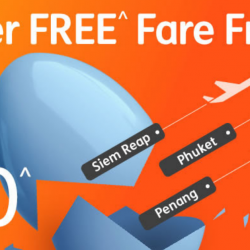 It's Friday so another round of S$0 Weekend FREE Fare Frenzy at Jetstar! Fly at just S$0 + S$49.80 tax from Singapore to Kuala Lumpur, Jakarta, Medan, Bali, Phnom Penh, Siem Reap, Haikou, Sanya and Shantou! Sale ends Sunday 31 March 11.59pm SGT, hurry and book now! 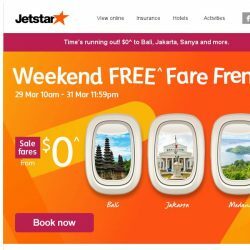 [Jetstar] $0^ fares to Bali, Jakarta and more! 3 days only, book now. [Jetstar]  Unlock your $0^ fares to 8 other destinations this week! 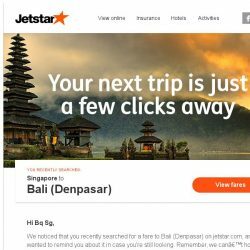 [Jetstar] Still looking at Bali (Denpasar), Bq Sg? 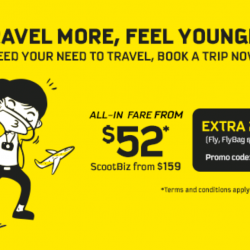 Book by 26 Mar 2019 Scoot: GTG Sale with All-in Fares from SGD49 to 64 Destinations! Is your window seat stuck inside an office? You GOT TO GO! Take off for real and witness gorgeous views of the East with this week's destinations on Scoot! When you got to go, you got to go. Feed your need to travel with their weekly GTG Sale! GTG takes over from Take-off Tuesdays with the same low fares! Catch it at 7am tomorrow! 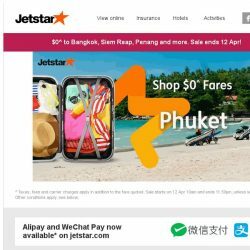 [Jetstar] $0^ fares to Bangkok, Taipei and more! Sale ends tonight, don’t miss out.